On one side of this galactic battleground are the heroes of the Rebel Alliance. Only rarely can these heroes go toe to toe with the unlimited reserves of the Imperial Navy and Army. Instead, the iconic characters of Star Wars and the unsung heroes of the Rebellion must work in secret, utilizing diplomacy, reconnaissance, and the Force to achieve their aims. Even when the Rebellion deploys its full military strength to win a battle or destroy a key Imperial emplacement, they need the groundwork put in place by Alliance Special Forces. Opposing the heroic endeavors of the Rebel Alliance is the massive power of the Empire, led by the twisted Emperor. The dark side of the Force is strong with the Emperor and Darth Vader, and the military might of the Empire is unparalleled across the galaxy. Whether you undertake aggressive negotiations or hire bounty hunters and scum to ferret out Rebel spies, making the Empire the ultimate power in the galaxy rests in your hands. In every round, the Empire and the Rebellion struggle over the outcome of a contested event, whether infiltrating Imperial Center or carrying out a surgical strike on an enemy base. Each struggle requires you to use all the resources of the galaxy-spanning Empire or the Rebel Alliance, including cunning diplomacy, martial prowess, and manipulating the Force. 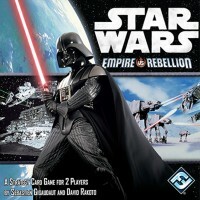 At the beginning of each round, one event card is revealed from the deck, determining the outcome of the Empire and Rebellion’s newest conflict. You bring more resources into play at the struggle for an event by drawing and playing resource cards from your deck, each of which has a resource value in the upper left-hand corner. Your goal in playing these resource cards is to get as close as possible to the event’s objective value without passing it. If you pass the objective value, your secret exploits have become obvious to your opponent, allowing them to seize the event. You must also consider the event’s capacity, which limits your level of interference in the event, keeping you from playing more cards than the capacity. To successfully win these struggles and reclaim the galaxy in Star Wars: Empire vs. Rebellion, you will need to utilize all of your resources. Every turn, you can increase your faction’s presence at the current event by drawing the top card from your deck and putting it into play. Each resource card you play give you more power and brings you closer to the objective value of the current event. As an example, the resource card shown to the right has a resource value of five, which it contributes to your total resource value while in play. Playing more resource cards may bring you closer to your target, but it also makes your efforts more obvious. If your total resource value ever passes the event’s objective value, your forces are discovered and your opponent claims the event. 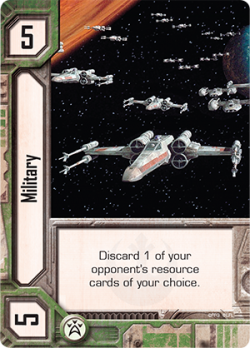 Instead of playing a new resource card, you can also trigger the power of a resource card currently in play, exercising the might of the Empire or the cunning of the Rebel Alliance. To activate a resource card’s power, you must exhaust it by rotating it 90 degrees clockwise. Once a card is exhausted, you can’t use its power unless it becomes ready again. In addition, an exhausted card contributes its exhausted resource value, shown in the lower left-hand corner of the card while the resource is ready. The struggle between the Empire and the Rebellion is fought on a multitude of battlefields, through canny diplomacy, military force, timely reconnaissance, or commitment to the Force. Accordingly, there are four different types of resource cards with distinct powers. By flexing your faction’s military might you may discard one of your opponent’s resource cards, depriving him of his most important resources. Diplomacy cards can discard either themselves or one of your other cards, allowing you to manipulate the ways your forces affect the current event. Recon cards provide critical intelligence by inviting you to look at the top two cards of a resource deck and discard one of the cards, helping you filter upcoming resources for yourself or your opponent. Finally, you may find the power of the Force to be most helpful in exhausting one of your opponent’s resource cards and reducing their options for coming turns. If you don’t want to draw a new card or your best resources are already exhausted, you may spend an influence instead. The Rebel Alliance has connections stretching across the galaxy, and there are always individuals eager to sell information to the Empire in exchange for credits. By spending influence to help tip the balance of a current event, you may ready one of your exhausted cards, allowing you to use its power again and maximizing its effect on the current event. When both players choose to pass their turns, the player whose total resource value is closest to the event’s objective value without surpassing it seizes the event and its victory points, along with any influence he may receive from victory. When the Empire or the Rebellion reaches seven victory points, it demonstrates its dominion over the galaxy and wins the game of Empire vs. Rebellion. As you shape the fate of the galaxy, overarching strategies and the aid of iconic characters adds greater depth to your games. 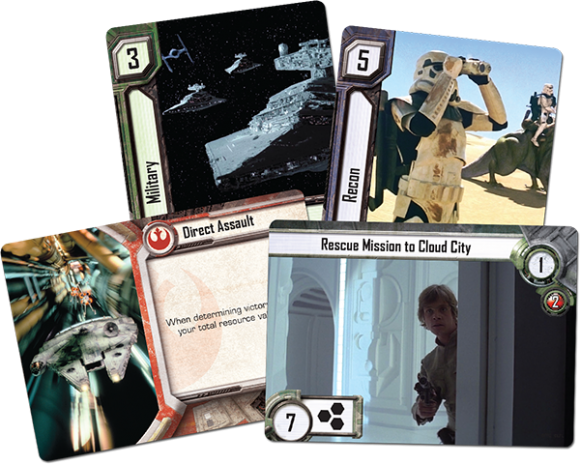 Characters are shuffled into your resource deck, where they can arrive to shift unfolding events in the favor of the Empire or the Rebellion. A character’s presence can inspire your other troops to great efforts, and characters have the highest resource value in the game while ready. Circumstances may require your characters to take a more personal hand in events. Exhausting a character causes his resource value to fall to one, but triggering a character’s power is often worth it. Obi-Wan Kenobi, for example, allows you to use his wisdom and preparation to play one resource card of your choice from your discard pile, potentially restoring a key card that your opponent discarded with a military resource card. General Veers, on the other hand, attacks your opponent’s resources. By exhausting General Veers, you may discard the top card of your resource deck, then force your opponent to discard his cards with a lower resource value, using the General’s cunning to eliminate the Alliance’s ability to utilize its resources. Strategy cards offer another way to alter an event struggle. At the beginning of each event struggle, both players secretly select a strategy. A strategy shapes how a faction will engage with the current event, whether you choose to infiltrate an enemy base, or even deceive your opponent with the Deception strategy. Choosing the correct strategy for an event struggle is one of your most effective tools for claiming victory in Empire vs. Rebellion. The future of thousands of species and planets rests in your hands in this fast-paced card game. You will need all the resources available to you to best your opponent at the most crucial events of the Galactic Civil War. Will the Rebel Alliance overthrow the tyranny of Emperor Palpatine, or will the Empire quickly crush the last vestiges of opposition? The choice is yours in Star Wars: Empire vs. Rebellion. Add a Review for "Star Wars: Empire vs. Rebellion"